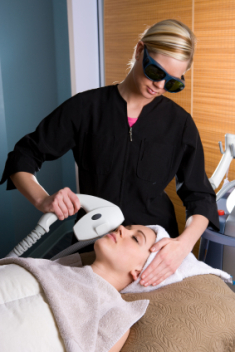 The G8 IPL is a new, non-invasive approach to skin rejuvenation. It delivers a light treatment that can be customised for different skin tones and surface imperfections associated with ageing and photo damage. It’s the heating of the pigmented brown or red blood cells with a targeted pulse of light that causes the therapeutic effect. The result is an exceptionally effective and skin will be rejuvenated and fresher. When the pulse of light is delivered, patients will experience a mild pinching or stinging sensation. Gel is applied to cool the skin prior to vascular treatments, Anaesthesia or pain medication is typically not required, however patients are offered a numbing cream to increase comfort. Recovery is rapid and patients may return to normal activity straight after treatment. Brown pigmentation may darken and be more obvious for a few days until it flakes off. The G8 IPL is ideal for any part of your face, neck, and décolleté that has skin redness, telangiectasia (tiny veins) or brown spots. Light or low contrast brown spots that have previously proved difficult to resolve respond very well to this treatment. Rosacea is a chronic condition and cannot be “cured” with any laser or light source, however in many cases the appearance can be improved. One to three treatments are usually sufficient to see results with treatment time dependent on the area of the body being treated. Typically three treatments are performed at monthly intervals for optimal results. Most treatments take less than an hour and additional treatments may be recommended especially for excessively sun-damaged skin. Within one to three weeks, the darkened spots will flake off and fade. Skin redness associated with telangiectasia will decrease and the mottled appearance of the skin’s complexion will improve. WHAT CAUSES SUN AND AGE SPOTS? Sunlight, the elements and the natural ageing process all contribute to the development of dark spots and freckles. Your face, hands and chest are the first parts of the body to show signs of ageing because they receive so much sun exposure. Age spots and freckles are forms of pigmented lesions. They are caused by excess production of melanin in the skin by cells called melanocyte.